Four of Swords says you have a negotiating mind – the meditating mind which is flexible, committed to staying in balance and non – positional. Maintain balance on all four levels – mentally, emotionally, spiritually and physically. Move through these conflicting issues and resolve them. Stabilize yourself – rest and take this time to think of new plans. Your dreams will come true but you must wait. Things are changing – prepare your mind and make your plans. Give yourself time – this situation is getting better. There is no hurry now – consider this a convalescent period, a time to renew both your physical and mental energies and establish your thoughts. Be willing now to face the issues, pay attention and tell the truth. Do not be concerned with the outcome, for it will be as it was meant to be. Establish your own sense of order and harmony. Build a solid foundation upon which you can expand. Withdrawal can lead to healing – allowing you to recoup your strength by holding back from the fight until there is a better chance to win and giving yourself time to recover from deep hurt and wounding. However, withdrawal – even for the purpose of recovery – can shut a person off from the world, creating a kind of spell that only an outside energy can break. Has your confident mask grown too heavy? Have you responded to your difficulties by isolating yourself – preferring to hide from the world rather than show your other side or try to work with people, flattening your emotional reactions and trying to hide them deep inside yourself? A well-centered mentality – mental stability, reliability. A centering of thoughts before going on – mental foundation. An introspective turn of the mind, but not in the sense of the Hermit. A break in the “affairs of the day” so that you may soon return refreshed and ready to “do battle” again. Here is the completion of mental projects – graduations/certifications. A strong sense of your identity and self-worth. Planning, fundamental understanding – rationality, practicality, facts, objectivity, order – a need for cleanliness, discipline, obedience, law, control, self – confidence and patience. What can you do to gain a better perspective and be fair and just in this situation? Next to any Ace: Re-evaluate your long-term plans – check everything carefully before going ahead with any new ventures or your current situation. Three or more Court cards in the spread: Unless you “feel” absolutely sure, do not proceed with any new ventures – you are still experiencing difficulties in a certain relationship. Next to Judgment: Understand this lesson, so that you can avoid any similar involvements – learn from the pressure you have experienced. In the first position: This is a lifetime dedicated to the establishment of mental order, the necessary stability and foundation for serious intellectual work. A very strong, healthy sense of self characterizes this path. Fields requiring law, order, discipline, objectivity are favored. In the second position: The ability to find what you want on the moments notice, to mobilize people and material quickly when necessary. Here is the ideal community leader during the crisis of a natural disaster. You never give up no matter how tired or how hopeless a situation may look. In the third position: Be confident. You have done your homework and are mentally well prepared. Be composed, meditate and continue to establish greater order, discipline and accuracy. In the fourth position: Your passion is to be in control of your emotions and to be cool and steadfast under fire. One who can package and present the emotions. In the fifth position: You are confident, calm knowing you are ready. You are composed, well-centered in your thoughts. Your approach is valid. In the sixth position: As you center in your mental affairs, your self-assured calm, may stir some waters. For, as you center you actually present a different facade to onlookers. This could be disconcerting to your mate or to some of your inner circle. What happens as a desire for order and control hits the Emotional Plane? In the seventh position: You are being pulled toward the mental plateau that will serve as your foundation for the rest of your life. The most obvious symbol of this is a graduation. Go willingly, if not enthusiastically. In the eighth position: The mind is very much in charge and to your advantage. This could be a time of physical rest, a retreat to take stock. You are in a waiting mode, a period for patience. In the ninth position: In your gut, your subconscious, you feel on top of things or at least that you have your Emotional Plane and creative energy under control. To have this card here suggests that your conscious mind may not have this same opinion or that you may not be as organized in you Mental Plane. In other words, to outward appearances you may look scattered, but actually be quite together underneath. In the tenth position: You will be assured, beyond a shadow of a doubt that your mind is serving you well, that you are centered and working toward the right goals. You will be empowered to act decisively and to great effect with all the authority you need to accomplish your goals. 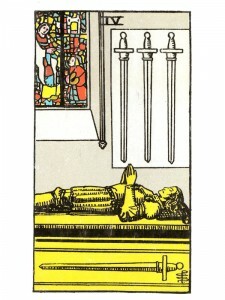 My 4 of swords was next to magician 8th position and 6th position was 10 of cups any thoughts? Thank you for sharing your knowledge wisdom and insight I am very grateful. Very accurate. I read my own cards then I read what you have to say as well to see how I am growing and listening to my angels and Spirit Guides. I find it a very helpful way to continue growing in my Tarot work. Brightest Blessings.